The climax of the 2018-2019 NFL season is here. 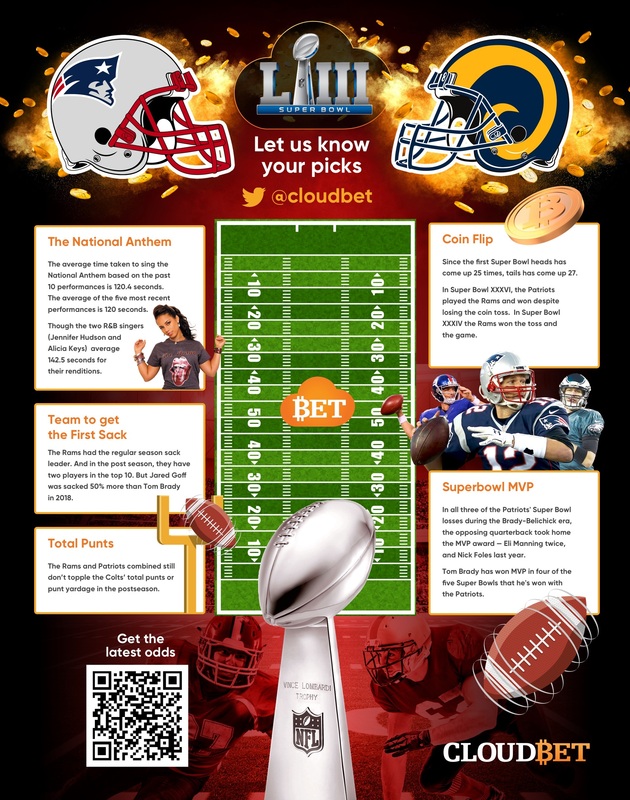 Cloudbet offers over 320 props markets and the highest bitcoin betting limit for the Super Bowl - up to 20 BTC. Here are some of the best value odds for the match. Where is the bitcoin betting value? Building up to the ultimate face-off on another exciting NFL season, the New England Patriots (currently at 1.77) will be fighting for the title for the third consecutive year, this time against the Los Angeles Rams (currently at 2.16). To add to the excitement, Cloudbet is offering the highest bitcoin betting limits of all, a massive 20 BTC - one of the many reasons our players choose to play with Cloudbet. Not only that, but we also offer over 320 Super Bowl prop markets so you will have even more chances to win. Making it even better, we came up with a bitcoin betting guide for one of the most popular sporting nights of all. Here is what you can expect from the match, and also some value props you can bet on and increase your winnings. The Patriots head back to the Superbowl for the third year in a row and ninth since the Brady/Belichick partnership began. They will face off against Sean McVay's Rams who will make their first Superbowl appearance since they lost to a rookie Tom Brady in 2001. It's difficult to pick a winner, which would suggest that there’s value in taking the underdog on the spread, but it's hard to bet against the Patriots - even to cover. However, these two offences line up well against the respective defences. The Patriots have reformed themselves to be a run-first team who, when passing, employ quick releases to get the ball out of Brady's hands. This completely nullifies the Rams strength, the pass rush, and could open up the possibility of a high scoring Patriots offence. For the Rams, the Patriots will focus on stopping their two-headed rushing attack of Todd Gurley and CJ Anderson, which is easier said than done. However, as they will have to sell out to stuff the box, Robert Woods and Josh Reynolds could be the focal point of the passing game with space over the middle. If Goff is forced to pass more often, then these two would be the beneficiaries and have history in moving the chains. That said, immediately after the second Conference Championship, the handicap line opened with Rams as a 1 point favourite. 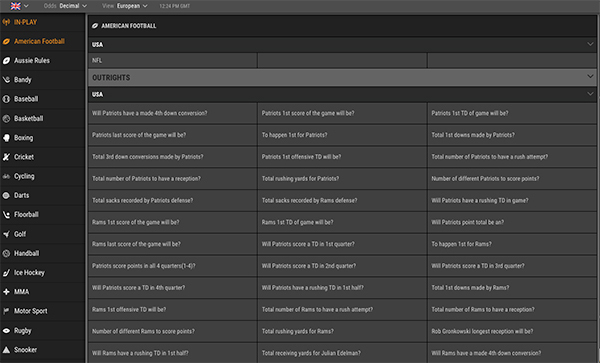 Within an hour, the line moved to "pick 'em", followed by the Pats installed as 1, then 2-point favourite. The initial move away from Rams favouritism can be considered sharp action, with some hoping for +2.5 the other side for a "middle", where a Pats tight victory sees both bets as winners. With the public money expected to be one-sided in favour of the Rams in the 48 hours before kick-off, the line may edge back towards pick 'em once again. Bear in mind that "3 is the magic number" in NFL betting, so in the unlikely event of the Rams being offered at +3, that # won't last long. Note: 3 is the magic number because more NFL matches are won/lost by exactly 3 points - although less so since the extra point rule change recently. - The Patriots having won the last five meets between these two sides; - none of which were against Sean McVay – who took over the head coach job in La La land two seasons ago. - Brady having been MVP on all but one of the five occasions the Pats have won the big one. The even money (2.00) offer this time is one for the fairies and desperate. - Both coaches and their offensive and special teams coordinators being prone to some unconventional razzle-dazzle. You can expect at least one no-name from deep in the depth chart to feature in a big play. - The possibility of payback time as Rams WRs Robert Woods and Brandin Cooks, who both played with New England last season, have 12 and 11 catches, respectively, in this postseason. Both are priced at around even money (2.00) to score a TD at anytime. Like the Brady MVP odds neither quote wets my appetite. SO what did we learn from the Conference finals that might be of use to make some money in Sunday night’s showdown? 1/ The officiating still stinks – with the “no pass interference call” that could/should have wrapped up proceedings in the Saints’ favour one of many that the New York bosses would like to VAR. 2/ Rams all-everything RB Todd Gurley might not be the man for the job early on Sunday night. Gurley looked lost and very nervous (bottlejob?) early on last week. His two fumbles put the Rams in the early hole. 3/ Belichick and Brady are still an offensive force, but the Pats’ defense (which gave up 24 points in the 4th quarter) will struggle to keep the lid on the Rams offense for four quarters. 4/ LA have the league's most disruptive force in DT Aaron Donald. Donald and co neutralized Dallas' running game and held the high-powered New Orleans to 290 total yards. 5/ The Rams win if the D-line pressurise Brady and force him to keep one of his favourite targets TE Rob Gronkowski in to block. 6/ As I forecast, both of the Conference finals featured comebacks; with the Rams overcoming a 13-point first quarter deficit to defeat the Saints 26-23 in overtime in their noisy dome and the Pats got out of jail 37-31 in overtime in Arrowhead, after allowing Kansas City to rally from a 14-point half-time deficit. The 10/1(11.00) odds on the game going into overtime are not terrible, but (once again) I can stay clear. On Sunday I will have small interest on the Pats trusted FB James Devlin #46 @14/1 (15.00) and outlet WR Cordarrelle Patterson #84 @13/2 (7.50) to score a TD at ANYTIME. Neither will line up every play, but will get their number called at some stage and most likely inside the Rams redzone! For the Rams, TEs Gerald Everett 9/2 and Tylor Higbee 7/2 will both get opportunities, but there is not enough upside in the odds. Success for either (or both) of the picks will cap off a fruitful late season, which was evidenced by Taysom Hill and Tylor Higbee landing odds of 9/2 (5.50) and 4/1 (5.00) respectively in the NFC Conference final and getting me rather excited about the prospects of a nice double had Tom Brady snuck into the end zone in the second game. There has been some illness in the Rams’ camp and both their kicker and punter have been under the weather. Both should be fully recovered come game time. I will not be getting involved in the pre-game outrights, handicaps or totals; but don’t fall asleep or give up if a team goes down two TDs. 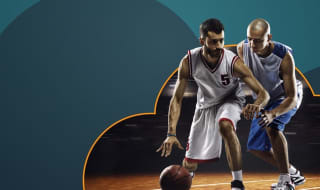 Cloudbet have over 320 prop markets on the big game as well as accepting up to 20 BTC on the main markets, so you will have plenty of chances to win. We have selected some of the best value odds amongst these to help you increase your earnings. Over 320 special props markets - what's your bet? To highlight the meteoric rise of Sean McVay to becoming a Superbowl coach so quickly, he actually played against Edelman in college. However, the best part of the Rams defence is the pass rush and whenever Brady is under pressure he releases the ball quickly to his safety valves. You can also back Jame White to go over 44.5 receiving yards at 1.60. The Patriots will be relying on the run, as they have done all through the playoffs, which invariably will lead to a few third and short yardage situations. They have one of the best conversion percentages all season at 43.6% and an amazing 60.6% in the playoffs. In the two playoff games so far, they have converted 20 first downs and there's no reason why they won't have the same opportunity again. We have A LOT of props for the Super Bowl. Just go to Sports, then click on American Football, then USA. Under NFL, you will find the Outrights markets - knock yourself out! Cooks is a fantastic receiver with great hands and speed to burn. However, he is not utilised by the Rams as a possession receiver and is there to open up the field. As such, he doesn't compile huge reception numbers. Since week six he has only topped 5.5 catches five times in 13 games. The Patriots focus will be on stopping the Rams running game but they still have one of the best corners in the game, who will be all over Cooks and limit Goff's looks. First turnover of the game will be? Jared Goff has 14 fumbles this year, which is almost one per game and is an extraordinary number for a pocket QB. Sony Michel had a history of fumbling while playing for Georgia and the Rams defence will be keyed in on him all game long. With the game being played indoors, the QBs should be much more accurate, which gives value on the fumble. Coin flip - will coin land on? One of the great things about the Super Bowl prop markets is that you can bet on almost anything and this is the perfect example. Historically, tails is winning 27-25 compared to heads.